I've noticed I have the tendency to avoid posts in which I have TOO much to say. Like our cruise to the Bahamas over Thanksgiving break way-back-when. We did sooooo much...everything from lounging on a beach right on an airport to visiting an iguana farm. But to write about it would take twelve pages! So I never wrote about it. Never posted pictures--nothing. A whole trip to three amazing islands with no record of it! It might as well have never happened. Now I'm feeling that way about Comic-Con. Even though it was only a one-day event for us, it was ten straight hours of complete over-stimulation, and to write a blog entry about it would go on and ON. So I've been avoiding it. 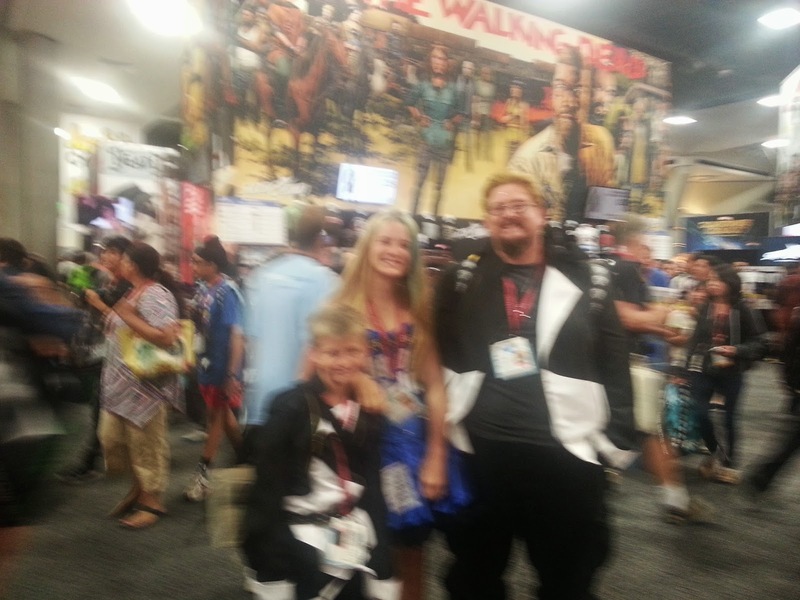 In order to break this cycle (because even though recording family memories sometimes feels boring, three years later it's awesome to read them), I'm going to simply write down three things about Comic-Con. Three ONLY. My favorite thing, my least favorite thing, and what we'll do differently next time we attend. And then of course I'll post a few pics. My Favorite Thing about Comic-Con: This sounds funny, but I'd have to say the people. Comic-Con is ridiculously crowded--like, I can't believe it's legal to stuff that many people into one building. 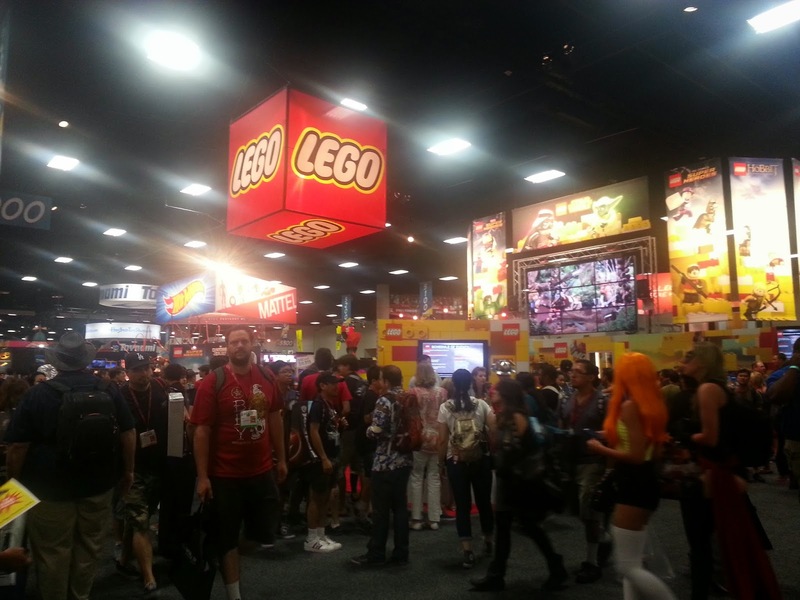 According to the news (I can't remember which station), over 160,000 attended Comic-Con this year. But, despite the crowds, everyone I encountered there was SO friendly, whether it be worker or attendee (except for the security guards--they could be jerks). Overall it was a very spirited, happy group of people. Oh yeah, and the costumes! And all the awesome art! And all the freebies! (Okay, I'm trying to cheat by squeezing in more than one favorite thing, but I'm done now). My Least Favorite Thing about Comic-Con: In addition to the above-mentioned crowds (seriously, by afternoon it was elbow-to-elbow gridlock), I hated the lack of seating. If you attend one of the panels, that provides you a great opportunity to sit down and relax for a little while. But in the convention hall itself, you're forced to walk around for hours amongst the various booths with no relief. There were a few tables near the snack bars, but they were always occupied. Always. And anytime we tried to sit down against the wall in one of the side-corridors, the security guards would come by and tell us that we needed to keep moving. At one point we had ordered a couple trays of nachos, and with no where to sit, we took our food outside of the main convention hall and sat against a wall FAR AWAY from foot-traffic to eat our food. We still had a security guard come hassle us, telling us we needed to move along. It was beyond frustrating, because there was no way to eat nachos while trying to balance our conference bags and purchases. We ended up having to exit the convention center completely just to sit down. Because of teaching, I'm used to being on my feet all day, but even my legs were throbbing by the time we left. So if you ever attend Comic-Con, wear comfortable shoes and be prepared to be on your feet indefinitely. What We will Do Differently Next Year: Despite the crowds and lack of seating, we still plan to go next year. 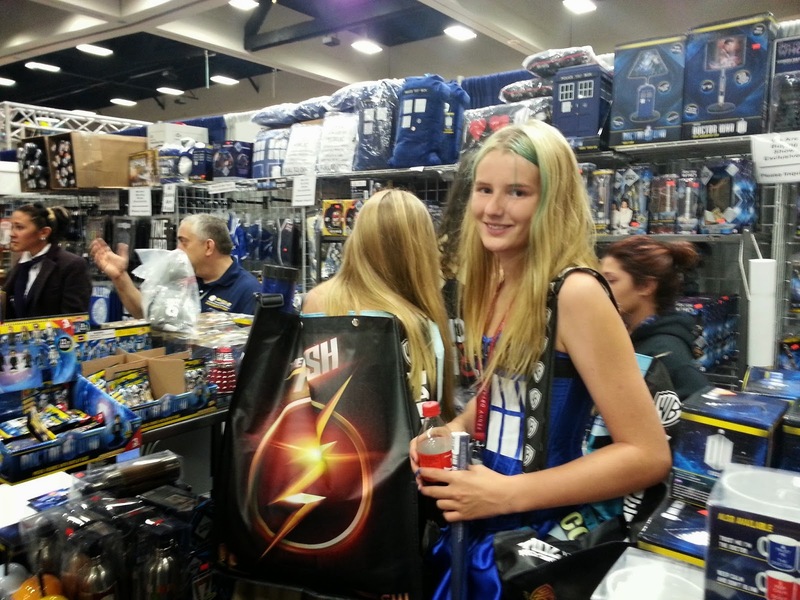 The thing is, Comic-Con actually wasn't that crowded from 9:00 to about noon. At those hours, there were even tables still available near the Snack Bars. So next year, our plan is to go for three days instead of just one. The problem with this year is we only had ONE DAY, so we were forced to put up with a lot of craziness for the sake of getting to see everything. Going for three days will allow us to take our time, take breaks during the really busy hours, eat lunch at a "real" joint, return to our hotel as needed to recharge, etc. Overall it should provide us with a more relaxing experience. Clint already booked our hotel room, so we're ready to go. 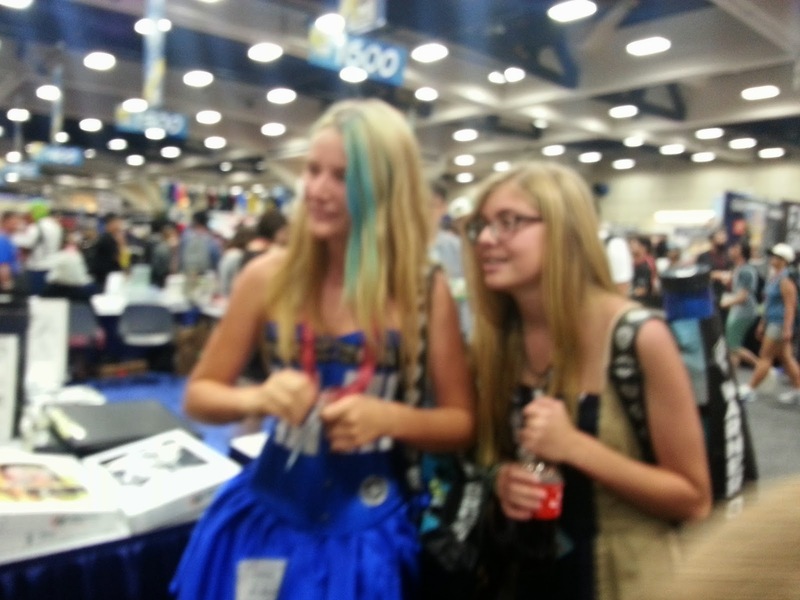 Trin and I getting ready to leave--her as a TARDIS and me as a Dalek. Her wig only lasted about an hour, and I switched over to jeans and flip flops in our parking structure when I found out we were walking nine blocks. 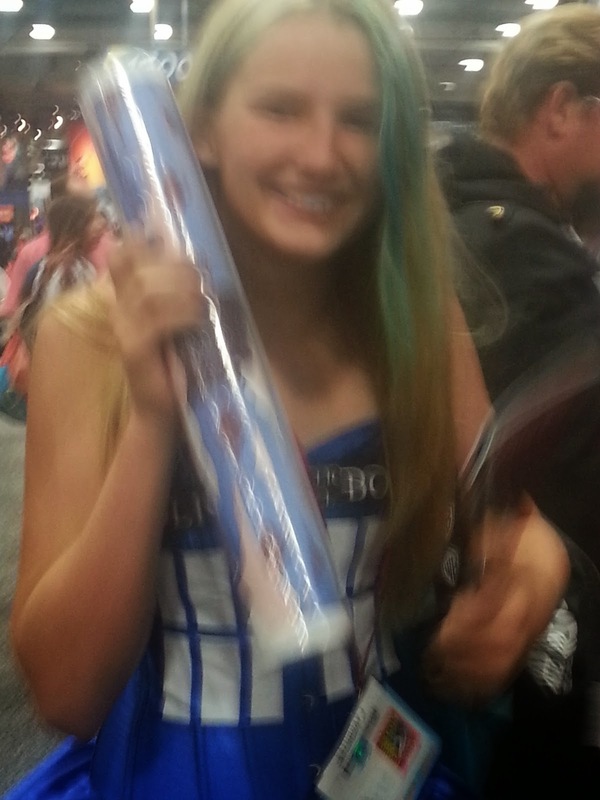 Arghhh, blurry. Clint and Elijah were characters from Assassin Creed. Trinity was so thrilled to get her Welcome to Night Vale poster. She got it autographed later by four voice-actors of the cast, plus the creator of the show. According to her, it was the "best day EVER." She repainted her entire room this week to match her poster. Clint and his new BFF. 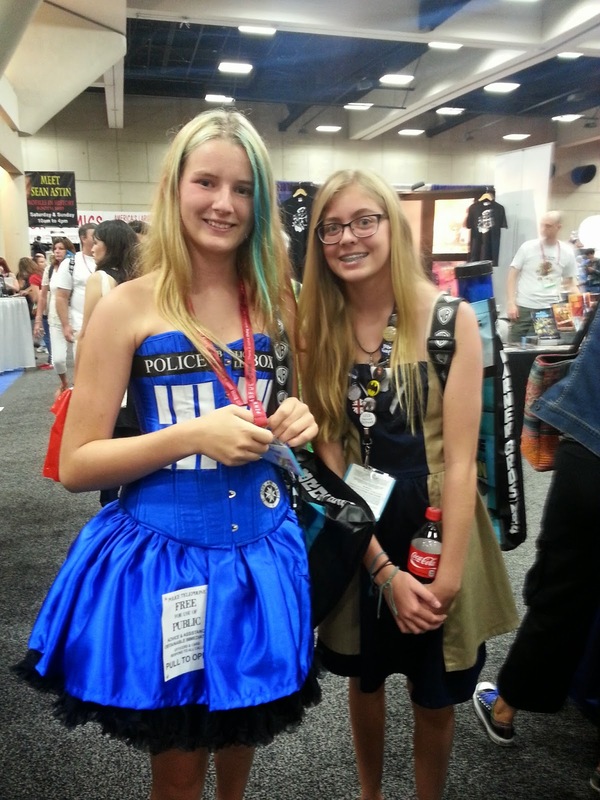 Trin and Tris in one of their favorite booths: The Dr. Who store. View from the window of the Starbucks two blocks away from the convention center. My favorite--the Outlander booth! I haven't even read this series, but I SURE AM now! (P.S. I love that young woman's quite authentic-looking period-dress). Trin and I with an Outlander guy. Clint has had a down payment on one of these since March. It's called an Elio. 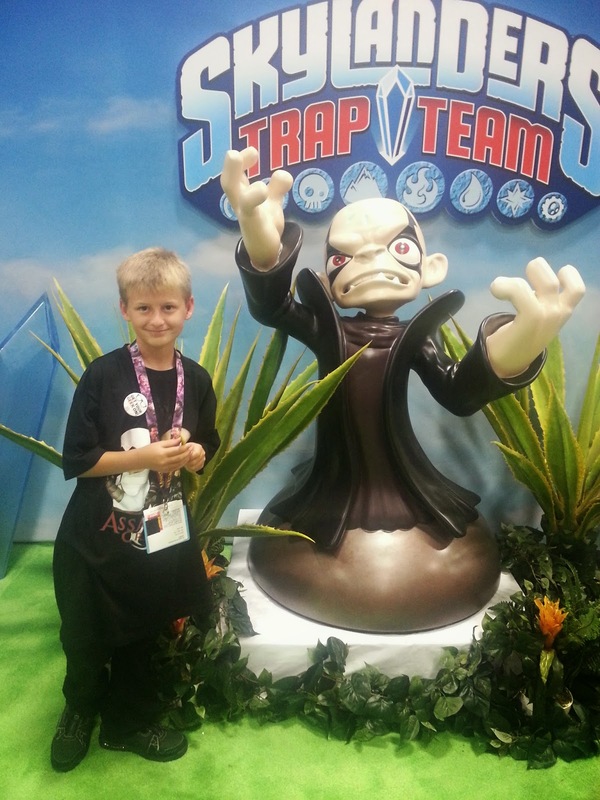 He was so excited to discover they had one on display at Comic-Con. That counted as only a few pics, right? Okay, sticking with three things wasn't so bad. Just the few costumes in this bunch are amazing! That's awesome that you're already all set for next year! I've been to trade shows before (though nothing as cool as this!) and all the walking around definitely sneaks up on you. You think you're fine and then BOOM you can't walk for the rest of the night. Some of the costumes were amazing Krystal--I wish I had snapped more pics. I was surprised by how few costumes there were in the morning, but by afternoon, the convention hall was teeming with cosplayers. And the details they put into their costumes...it's incredible. Feel free to harass me anytime via twitter about my wishy washy blogging (haha)! Love love LOVE the photos! Love the dresses! And yes, you should read Outlander!! I read the first three books on holiday a few years back, and then devoured each subsequent one. They are perfection :) Sounds like you had a blast. I would love to go to a huge con like this. I've only been to one, much smaller one here in the UK (but in October I'm going to the London Star Trek con and I'm *ridiculously* excited). Thank you for sharing! I would LOVE going to Star Trek Con Cheyenne--and in London?? That would have me GIDDY. I just started reading Outlander last night, and so far the writing is incredible. Now I'm getting really excited about this series. Unbelievable jealous... 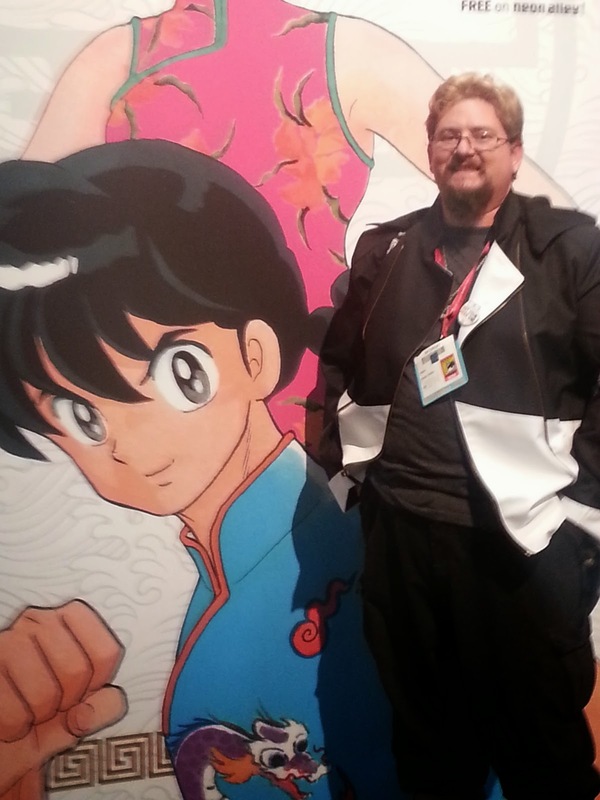 I miss Cons... Never made it to comic-con. Hopefully someday! Glad you could swing by! Now THAT is something that just doesn't happen in my neck of the woods! I think I would have passed out laughing.